George Gershwin: Shall We Dance: Promenade "Walking the dog"
Max Reger: Schlichte Weisen, Op. 76 #52, "Maria Wiegenlied"
Richard Wagner: Albumblatt for Piano in C Major "In das Album der Fürstin Metternich"
Moritz Moszkowski: Chanson Bohème from Bizet's "Carmen"
Valse oubliée, S. 215 #4 "Valse Impromptu"
This is a delightful disc that can brighten up any dull afternoon or evening! 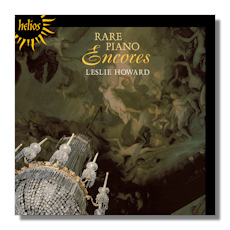 Leslie Howard has dug up some wonderful treasure troves from the proverbial antiques cabinet and there is much to enjoy and cherish here. Amongst the most memorable melodies, one can point out arrangements of Bizet by Mozkowski, a fantastic arrangement of tunes from Catalani's "La Wally" by Howard himself and there are also fine transcriptions by Grainger, Siloti and the ever-present Franz Liszt. There is not really much to say here and the only comment from me is just sit back and enjoy!